This page includes settings for E-mail Alerts, including search alerts and warning alerts. Note: The storage hardware on your system may also offer e-mail alerts, which are NOT configured through this menu. Please consult the Administrator Guide for more information. 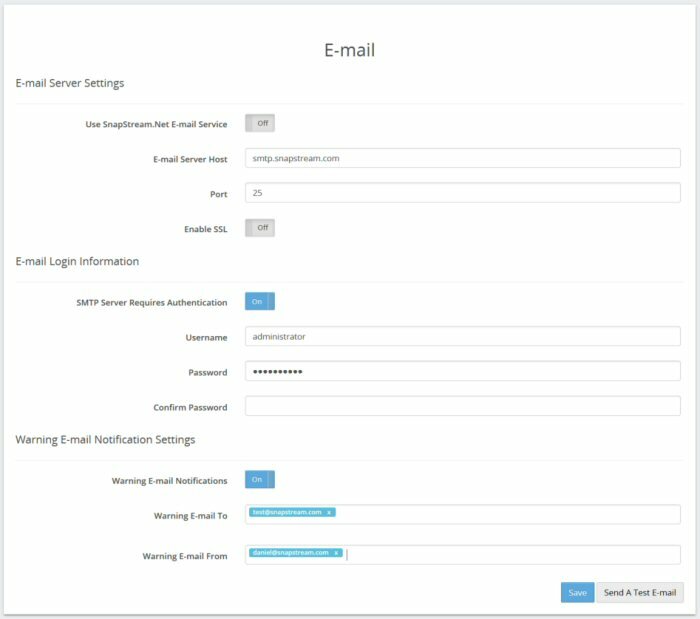 Use SnapStream.Net E-mail Service: If this box is checked, Warning e-mails (see below) and TV Alerts will be sent using a default mail server on SnapStream.Net. By default, SnapStream cloud share e-mails are sent using the SnapStream.Net e-mail service. E-mail Server Host: This is the address of the SMTP server on the local intranet. Enterprise TV will use this server to send its notification emails. You should be able to obtain this address from your mail administrator or IT department. Port: Most e-mail servers use port 25. If your server uses a different port, enter it here. Start TLS: Enable this option if your mail server uses Transport Layer Security. If your SMTP Server requires a user name and password, click On. Enter your credentials in the fields that appear. Warning E-mail Notifications: If this box is checked, Enterprise TV will dispatch an e-mail when it encounters warnings or errors. Warning E-mail From: Warning notification emails will be sent with this address in the From field. Warning E-mail To: Warning notification emails will be sent to this address. Separate multiple addresses with commas. Copyright © 2013 SnapStream Media All Rights Reserved.